Taylor Tashima sets the ball. The senior led the Wildcats to an undefeated weekend at the DePaul Invitational and was named tournament MVP. 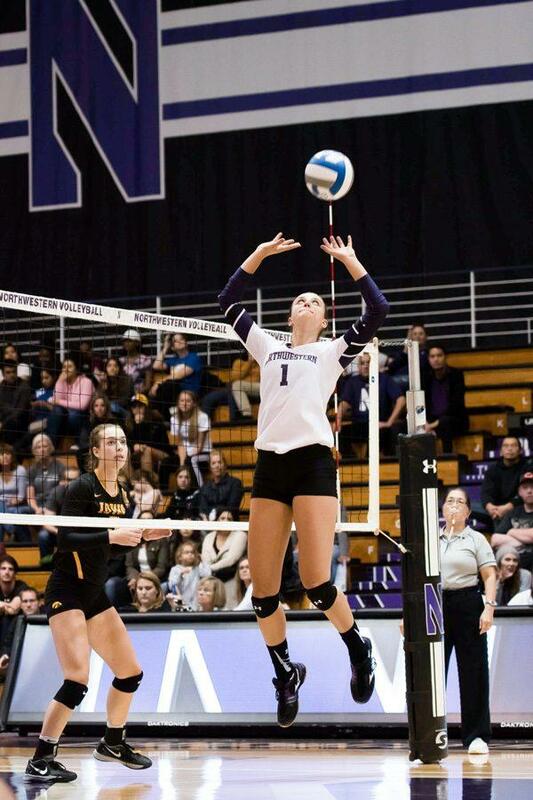 Northwestern continued its hot start to the 2017 campaign with a sweep at the DePaul Invitational this past weekend. The Wildcats’ trio of wins move them to 8-1 on the season as they approach the end of the nonconference slate. The start is NU’s best since 2014, when it won 12 of its first 13 contests. That team eventually finished with a 16-15 record. Senior middle blocker Gabrielle Hazen said the coaching staff has cultivated a culture that allows hard work in practice to breed in-game results. But coach Shane Davis still sees the need for more practice time “to iron out some of those dull moments” his team has in matches, he said. One of those dull moments came against Army (5-5) this weekend when the Cats made 14 service errors. The match against the Black Knights featured the Cats’ only snag en route to a perfect weekend. After dominating in the open match against Milwaukee (7-3) 25-16, 25-23, 25-22, NU saw its 14-set winning streak snapped Saturday in the third set against Army. The Cats regrouped and beat the Black Knights 25-9, 25-15, 23-25, 25-18, then cruised past the host, DePaul (2-6), 25-20, 25-13, 25-19. To put matches together, Davis said the Cats will have to continue developing team chemistry. NU is relying on seniors Hazen, outside hitter Symone Abbott and setter Taylor Tashima to lead seven freshmen as they are worked into different starting lineups, Davis said. This weekend, freshman outside hitter Ivey Whalen led the team against Milwaukee with four blocks and an ace while freshman outside hitter Nia Robinson solidified her place in the starting lineup by improving to a .318 hitting percentage on the season. Aside from their leadership roles, the seniors are also moving up the NU record books. Against Milwaukee, Abbott slid up to No. 10 in school history for career kills. Tashima, who has been the Cats’ starting setter since she was a true freshman in 2014, was named the MVP of the DePaul Invitational and now ranks fifth in career assists in school history with 3,428. NU will look to continue its winning streak in its final nonconference tournament of the year next week at Virginia, where it will face Seton Hall, Bowling Green and VCU.